Can I feel the vibration of Ultrasonic waves? The frequency of Ultrasonic waves are 17.MHz, which is micro-pulse, so the human body can't really feel the vibration. But you can confirm its out put by dropping the water on the massage head. 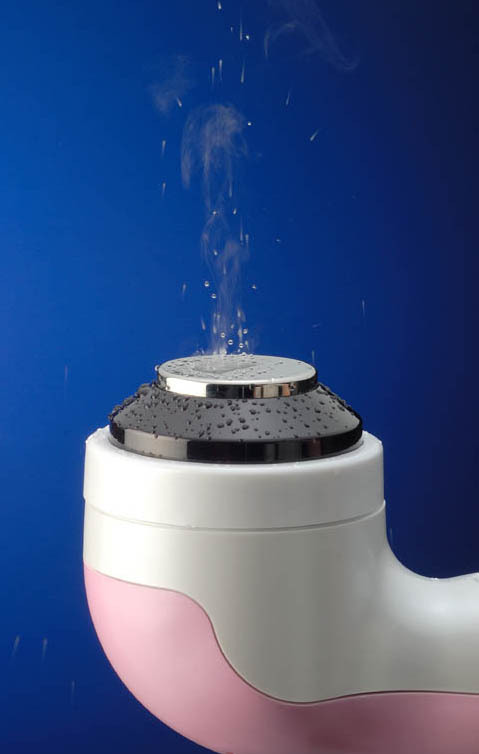 The water on the massage head will pop up and the water vapor will rise up by high and micro pulse. Can I use massager when the battery is low? You can connect massager and the charger with a DC cord. This way, massager can still be used even when the battery is low. Can I clean the devices with water? NO, YOU CAN'T CLEAN THE DEVICE WITH WATER. . It could cause failure, fire and or electric shock. After use, wipe off excessive gel with clean cloth or tissue. Can I use the massager everyday? Yes, you could use REX KARA devices every day as your daily skin care and body care routine. However, please do not use over 20 minutes per day for your face and body respectively. Follow recommended treatment minutes for optimal results delivered. Can I use other gel or cream instead of REX KARA Gel in the package? YES, YOU CAN. It depends on your mode selection, you can use other products instead of REX KARA gel. -Do not use internally and avoid using near mouth, ears, and center of the throat. -Do not use on open sore, wounds, or infected areas. -Do not use if pregnant, having a peacemaker, heart disease history or other medical conditions.